We’ve all heard the theory that writing things down can make our plans clearer. When we actually see the words written across a page, our minds are better able to focus on the points and make them become an actuality. There are also similar theories regarding the writing of journal entries and letters, which is probably why people who are dealing with grief or going through a difficult time are advised to keep a diary and ‘let it all out’. The process allows them to sort out their emotions and feelings, and perhaps see the situation in a different light. 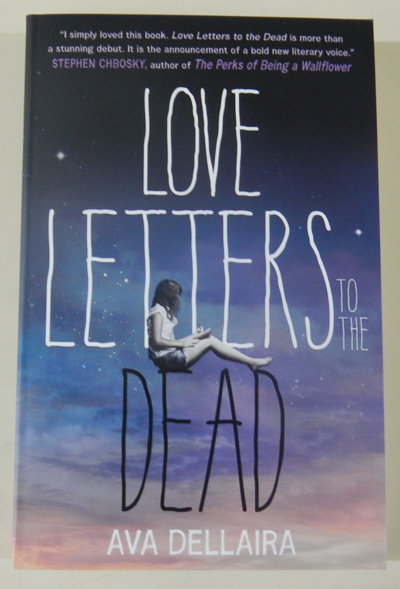 For new high school student Laurel, it all begins with an English assignment- write a letter to a dead person. Like most teenagers, Laurel chooses a famous person to pen her letter to, but unlike the rest of her class, she finds that she is unable to turn it in to her teacher. Instead, she begins writing a series of letters, throughout the course of the year, which help her to deal with everything that’s going on in her life, and help her make sense of who she is as a person. Foremost in her mind is the guilt she feels over the death of her older sister May, and her inability to understand how her amazing, beautiful, and ultimately flawed hero could suddenly leave her. May meant the world to Laurel, and her absence tears a hole in their already fragile family. Adding to this trauma is the fact that Laurel can’t explain what happened to her sister- she was the only other one there, and although everyone is seeking answers, Laurel hasn’t really got any to give. She thinks she knows what happened but she can’t voice it with any certainty, and it isn’t until she begins writing her letters to the dead that she is able to show some sort of understanding of the events. Writing the letters becomes a cathartic experience for Laurel, and she tells her dead letter recipients everything- about new friends and new love and new experiences. She tells them about her new best friends Hannah and Natalie who love each other but are too afraid to make their relationship known for fear of the backlash. She tells of the mysterious but sweet boy Sky, who she’s slowly falling in love with. She tells of her memories of May, and the magical things they would get up to as children. She talks of her splintering family- her mother who is seeking her escape at a ranch in California, her father who takes everything day by day and her lonely Aunt Amy whose love for Jesus is a ruling factor in her life. As Laurel’s letters reveal more and more about her life, she begins to link the experiences she has with moments in the lives of her dead famous people. She recalls watching Judy Garland, River Phoenix, Allan Lane and Heath Ledger perform on television and movie screens, listening to Kurt Cobain, Amy Winehouse, Janis Joplin and Jim Morrison on the CD player, reading the poetry of Elizabeth Bishop, E.E. Cummings and John Keats in books, and wondering about the disappearance of Amelia Earhart in the skies over the Pacific Ocean. She picks out momentous parts of their lives that have some semblance to the feelings and emotions that she is currently dealing with and alternately berates them or rejoices in the way that they too dealt with their situation. She likens their emotions to her own and draws comparisons, pondering how she would have dealt with their moments if she had been there too. This is a heartbreaking but sweet coming-of-age story, highlighting the life of a teenage girl as she comes to grips with what she has lost and what she has gained. As she writes her letters, Laurel learns more about her deceased sister and the life challenges she will need to face without her. She learns more about herself, and what she is capable of, and realises that speaking out, no matter how difficult, can be the best thing to do for yourself and the ones you love.